Famous For: Tourism, adventure, flora, fauna, photography. Entrance Fee: The entry fee to this reserve is very nominal and sometimes varies from season to season. You can check with the officials once you reach there. Visit Time: The reserve is open on all days of the week from 7 AM to 6 PM. It is wiser to visit here during the daylight. Visit Duration: Approximately 2.5-3 hours. The Kalatop Wildlife Reserve in Dalhousie is one of the major places of tourist attractions. It is a natural habitat that exhibits the astonishing beauty along the Ravi river. It is most ideal for travelers who are looking to spend some great quality time with their family or friends. If you want to make the trip even more special, you can plan a small picnic amongst the greenery. If you are planning a trip to Dalhousie soon, keep this one on the very top of your lists. Also ensure that you dedicate an entire day to visit here and make memories for a lifetime. In the Kalatop Wildlife Reserve, you will have to cover a distance of about 3-4 kilometres. Wearing comfortable shoes will ensure that your journey is fun and enjoyable. Carrying a light shawl or scarf is necessary if you are sensitive to the weather. There are storage rooms and lockers for tourists and travellers. If you have bags or any sort of luggage, you can keep them there. That way you can travel hassle free. Try avoiding the monsoon time. Rains and trekking do not go very well together and can bring about certain risks. If the place is covered with snow, you will not be able to drive into the reserve. Make necessary arrangements in terms of shoes and clothing. There are rest areas which include food facilities and washrooms. So, you need not carry a lot of stuff with you. Do not carry unnecessary plastic bottles or carry bags. Littering the reserve area is an offence. The best time to take a trip to the Kalatop Wildlife Reserve is between the months of April to October. Avoiding the rainy season is best because the roads get slippery and danger prone. Winters are very extreme with the temperature dropping to as low as -10 degree centigrade. The Kalatop reserve is well connected from the main city area of Dalhousie and airport and the railway station. From Pathankot (which is the nearest railway station), you can avail both bus or taxi services as per your convenience. The distance from the Gaggal airport is about 134 kilometres and the views are just splendid. The rides are convenient and hassle free. Trekking is done under the supervision of experts who can guide your way and ensure safety. There is no such threat and help is always available in here. Trekking is the first and foremost attraction in the Kalatop Wildlife Reserve. Most adventure lovers make the most of this opportunity. Shutter bugs are left spellbound by the scenic beauty of this place. The mountains, the lush greenery and the view from this place are breath taking. Bird watching is another popular activity. There are migratory and residential birds that enhance the beauty of this sanctuary. If you are keen on exploring more about the place, you can always stay the night and enjoy the queer sounds of the forest. The feeling is marvellous and worth the stay. 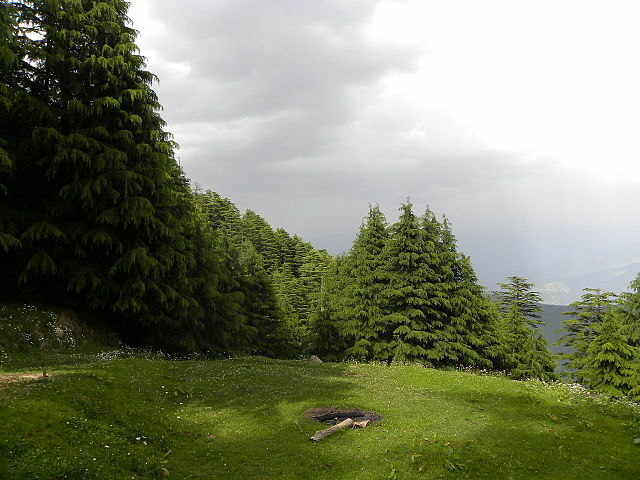 The Kalatop reserve in Dalhousie covers an approximate area of about 61 square kilometres. The mountain slops are about 2768 metres above sea level and this beautiful reserve is perched on the top of such mountains. The forest is rich in both wildlife and greenery. The trees of oak, rhododendron and cedars are found in abundance. There are trees which are very useful for medicinal purposes too. The animals that are seen include musk deer, barking deer, leopards and serows too. If you are lucky enough, you might catch a glimpse of the famous goat-antelope. Also, to most people’s surprise, there are more than 117 species of birds in the reserve area.